Prices are usually positive: you pay someone money for getting goods or services in return. Sometimes prices can be zero: you get something for free. Negative prices are definitely unusual: you get something and some money on top of that. Sounds too good to be true? Enter the quirky world of electricity prices, where prices can be negative for quite some time. When electricity prices are negative, we have a situation where demand is inflexible but supply is "too much". How can that happen? Sören Amelang and Kerstine Appunn have put together a very good summary of the story behind negative electricity prices on Clean Energy Wire: The causes and effects of negative power prices, and similarly, my colleagues Claude Crampes and Stefan Ambec at the Toulouse School of Economics: Negative prices for electricity. Negative electricity prices are found in Canada as well. I have looked at electricity prices in Ontario, and negative prices are very noticeable in particular regions of Ontario. 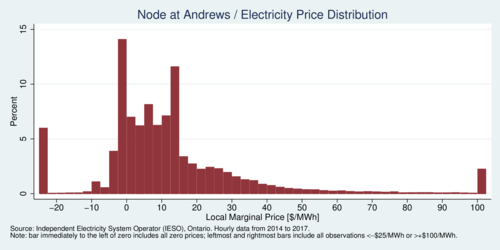 The Independent Electricity System Operator (IESO) in Ontario calculates marginal local ("nodal") prices for particular locations in its ten electricity zones. Why are electricity markets so different from goods markets? In the latter, when there is too much output production is halted or output is stored as inventory until prices recover sufficiently. The problem with electricity is that it cannot be stored. Supply must equal demand at all times, or the power grid collapses. Storage is currently only possible at a small scale except in a few (usually mountainous) places where pumped storage is feasible. Without storage, negative prices encourage consumers to consume more, even when they were not planning on. I usually pay a steep price for going on a flight to Europe or Australia, so I do so infrequently. But if someone pays me to fly to Australia tomorrow, I might not resist the temptation. When consumers are quite inflexible with their demand (I may have already planned something for next week rather than a flight to Australia), it takes a high negative price to entice them to consume more. It is easy to see that households do not respond to wholesale electricity prices at all: they pay electricity rates fixed by regulators. Only industrial customers may be able to vary demand on short notice. To cut the long story short: because electricity can't be stored, negative prices induce more consumption when there is excess supply. What are the sources of excess supply? There are three main reasons for production surpluses. First, there can be "too much" renewable energy. Windfarms tend to have a utilization rate of about one third of their nominal capacity. So a 100MW turbine generates on average only about 30-40MW, depending on location. But if a lot of windfarms all generate their full output, we have a potential surplus. In July 2015, on a particularly windy day, wind power generated 140% of Denmark's electricity demand. Fortunately, Denmark's neighbours were able to absorb the surplus output. Second, thermal power plants—particularly coal plants—are slow to increase or decrease output. This slowness of "ramping" means that these plants need to anticipate their output level hours ahead. At times this means producing surplus electricity during the ramping phase in order to achieve their desired output level a few hours later. Third, nuclear power plants are particularly inflexible with respect to varying output. Simply put, they are either on or off. If they are on and there is not enough demand, they would rather pay consumers to use more electricity rather than ramp down or shut off the nuclear reactor. All three sources combined, and we have a scenario for significant negative prices during short periods of time. In my research I find that negative power prices tend to persist for some time. These episodes last, on average, about 3-4 hours. Most of them are quite short, but a few of them can last longer. These episodes are also quite common: they usually occur about once a day. 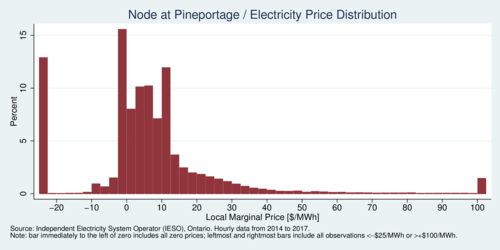 The diagram below shows the distribution of local marginal prices at two locations in Ontario: Andrews in the Northeast Zone and and Pine Portage in the Northwest Zone. In the two diagrams above and below, prices below –25/MWh and prices above $100/MWh were binned together to produce the tall bars at the very left and very right of the diagrams. Some of these prices can be extremely low or high. Zero prices were lumped together with the price just slightly in the negative area, an thus there are two spikes visible immediately to the left of the zero mark. At Pine Portage, 32% of local marginal prices were zero or negative. At Andrews, just about a quarter of prices were zero or negative. How does renewable energy aggravate the problem of negative electricity prices? The intermittency of electricity from wind farms and solar farms introduces an new element of uncertainty into the electrical grid. Intermittent output cannot be forecast well. If the conditions are right, intermittent output can reach unusually high levels. Feed-in-tariff schemes are set up so that renewable energy sources get priority access the grid. In some markets they need to bid into the market but are ensured a minimum guaranteed price. In that case it is opportune to bid a negative price when prices are zero or negative already for other reasons. A windfarms gets paid nothing if they don't feed electricity into the grid, and thus it pays to bid a negative price slightly less than their guaranteed feed-in-tariff. If you get paid $20/MWh guaranteed if you deliver, you would be willing to bid a negative price down to $–19.99/MWh and still make a profit of 1 cent per MWh. Guaranteed feed-in-tariffs can distort incentives for power producers. From the perspective of social welfare, it might be cheaper if output from windfarms could be curtailed (capped) when output is too high. When intermittent power producers are allowed to bid prices below their (zero) marginal costs, the market gets distorted. Excess supply was not an issue when there were few windfarms. As intermittent power supply has reached a noticeable share in some regions, subsidies such as feed-in-tariffs create new problems. Feed-in-Tariffs (FiT) are problematic in other ways too. I have argued in my research on Ontario's feed-in-tariffs that conventional FiTs are insufficiently differentiated. To the extent that subsidies are still needed to induce learning-by-doing effects and scale economies, it becomes increasingly important to structure FiTs in such a way that they maximize the overall benefit to the entire grid rather than satisfy just the economic participation constraint of independent power producers. Ontario and other jurisdictions have moved away from FiTs and have adopted auctions for procuring renewable energy. This helps bring down costs, but it leaves the location differentiation problem unresolved. Can improved market structure mitigate the problem of negative electricity prices? As Stefan Ambec and Claude Crampes point our in their article, the problem of negative prices is a fault in the current market structure that has a relatively simple fix. As power producers bid into the electricity market, the prices of their bids must reflect operating costs without subsidies. Intermittent power producers (wind, sun) should always bid $0, but no less. Thermal power plants that have ramping-up or ramping-down constraints, or nuclear power plants that cannot be ramped-up or ramped-down easily, can bid their immediate cost (possibly negative) when they are in a ramping phase or when they are ramping-constrained, and otherwise bid their ordinary marginal cost. This will not get rid of negative prices entirely as some ramping constraints still apply. However, the priority access for renewable energy needs to be complemented by a negative-bid prohibition. This means that sometimes renewable energy needs to be curtailed. Some environmentalists may find this an unsavory choice: restrict clean electricity in favour of fossil fuel plants. However, this is the nature of the beast: renewable power from intermittent sources needs to fit into the output mix, and it should not distort the "merit order" of electricity supply that ensures efficiency. Of course, some renewable energy sources are not intermittent: geothermal energy is an attractive 24x7 energy source which remains woefully underdeveloped in Canada. Another solution to the problem of intermittent renewable energy is the deployment of grid-scale energy storage. Today, the high cost of batteries keeps this uneconomical except in a few select locations, or where geography permits pumped hydro storage. Once batteries are cheap enough, expect the phenomenon of negative electricity prices to fade away. Sören Amelang and Kerstine Appunn: The causes and effects of negative power prices, Clean Energy Wire, 5 January 2018. Claude Crampes and Stefan Ambec: Negative prices for electricity, Toulouse School of Economics, 20 October 2017. Lucas Davis: Is solar really the reason for negative electricity prices?, Haas School of Business, 28 August 2017. A world turned upside down, The Economist, 25 February 2017. Frank Huntowski, Aaron Patterson, and Michael Schnitzer: Negative Electricity Prices and the Production Tax Credit, The NorthBridge Group, 14 September 2012. Alberta Electricity System Operator: Negative Pricing Discussion Paper, 2017.